Amusingly surreal. These are probably the two words I can use to describe how events are unfolding nowadays. And, I gotta say, I’m liking it. A lot. What we’re seeing now is the beginning of another era of history in the making. Granted, the last few years have also been history in the making. Yet, compared to what we’re delving into now, it was child’s play. Remember when then Field Marshall Abdel Fatah El Sisi told the Egyptian people to prepare for tough times ahead? When he said we would all work as one to pull Egypt out of its misery? Even better, remember how people cheered and said they were all behind him and that they would indeed work for a better Egypt? Apparently, many thought he was just kidding. Well, he wasn’t! And, so far, people are trying every possible trick in the book to undo their commitment. A few days ago, the president took a gutsy decision to increase fuel prices. Personally, I think he did the right thing at the right time. But that’s besides the point, because here is where it gets interesting. All of a sudden there is a public outcry at how the poor are being hammered by these inept policies and the mediocre government that sets them. All of a sudden, he became the boogieman, ruining their livelihoods and homes. Activists who once proclaimed in not-so-subtle terms that the poor should find a way to survive until they’ve accomplished their holy crusade of “cleaning up the country” came out, telling us very bluntly that “the government is adding insult to injury to the poor and making their lives even harder than it is”. I’m not going to waste my time and yours going into the extent of the hypocrisy of these two glaringly contrasting statements; they speak for themselves. On a different note, taxi, microbus and minibus drivers came to a screeching halt in their cars in the middle of Cairo’s busiest streets to protest. Those are the exact same drivers who hailed El Sisi as their savior. Who listened to him when he said what’s happening now would happen. They are also, for the most part, the same drivers who will play any one of a hundred games to get that extra one pound from you. The same drivers who hike fares when they feel like it. Who drive head on into incoming traffic. Then we have the sacred cows of the revolution. The “commentators”, “political experts”, “analysts”, “revolutionary news men and women”, “freedom writers” – all taking a go at the egregiousness of the price hikes and the poor man’s plight. In their infinite experience in mass communications, they unload upon us pearls of socio-economic wisdoms they learned from listening or repeating over and over and over again. Let me stop here to point out that Egypt has taken the cake in one sided, tailored, bespoke narratives. This has become the the undisputed land where the one sided story is the whole story. Now, here’s the flipside of the coin. Egypt has been drowning in the cesspool known as “government subsidies” for over 30 years and the time for silk glove solutions is way down there on the list of things that don’t work. Basically, the government has been buying/producing combustibles for your fancy wheels, paying 75% of its price and selling it to you at 25% of its cost. In other words, the government has been paying almost EGP 8 for every liter of fuel you put in your car. And in even other words, the gallon that cost US $9 in Norway costs US $1 in Egypt! 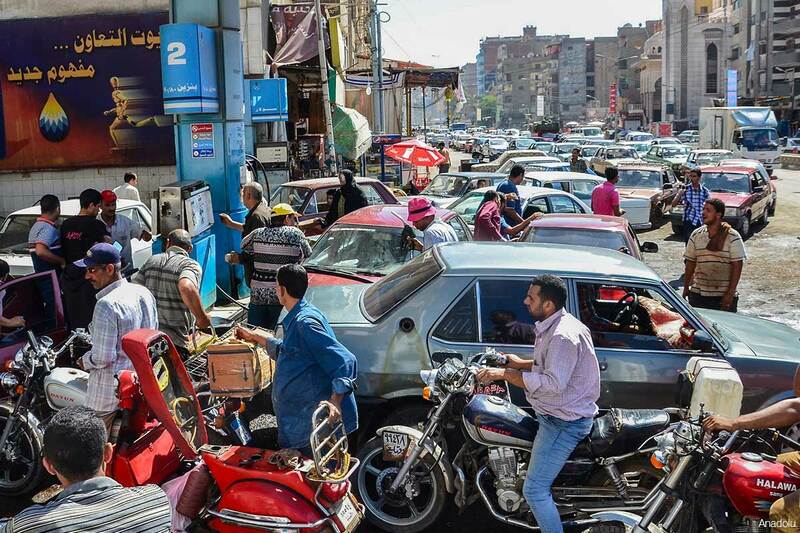 Egypt is ranked among the world’s highest countries in subsidized fuel prices, spending hundreds upon hundreds of billions to cushion you and the rest of the people from global market forces and fuel prices that, if known to the Egyptian people, should shut them the hell up once and for all. To put it simply, the country is bleeding money just so you can pay less for going about your day. And not only is it paying that amount for your fuel. It’s also paying 80% of your electricity bill. Yes, the electricity that keeps going out on an almost daily basis. Ever wonder why it goes out? Well, its because with the amount of money being spent to bring it to your home at the least possible price, there is no money to build and expand the power grid. The same applies to fuel subsidies. With the gargantuan amounts of money spent to bring it you these resources at the world’s lowest rates, there is no money to fix anything else. Now, with the two sides of the story roughly explained, here’s where the problem is: Egyptians are lazy! By all means, feel free to be offended. I am offending you. Because there is a nine in one shot that you are a bum. We, as a people, want it all while we sit comfortably on our couches, sipping our coffee, watching our wide screens and gossiping about the latest social fiasco. When it comes to the majority of those who are less privileged than you and me, their excuse for robbing the rest of the country blind is that they have mouths to feed. They have financial commitments. And, please, if you think there is no robbery here, just take a good look at the news and the amount of areas where drivers and merchants decided to jack the rates as they saw fit, claiming rising costs based on Einstein like mathematical equations. That does not discount or nullify the fact that there are many who are good and will be hurt by this. Hopefully, it’ll be for the shortest term possible and will not hit as hard as some are expecting. We Egyptians have a way of surviving. Just look at the last few years! The problem isn’t the prices. The problem is that we have no semblance of what a moral compass is. All I hear is “take from the rich and give to the poor”. Excuse me, but why the hell should the rich man who built his own empire by hard work and sweat give up his hard earned money to those who have not worked or, who work in shady ways, hoping for a quick score? Who sets the bar of “rich” and “fair” and “necessary”? If that were the case, might as well confiscate property and do what Abdel Nasser did back in his day: ruin the country all over again. There are ways and there are means. I sympathize, that is a given. I may come off as harsh, and I may be harsh, but harshness is what is needed right now at this moment in time where the country is being torn apart at the seams. The situation is dire. And everybody was told the situation was dire and that there would be measures to fix it. And they were told that these measures would be neither pleasant nor a walk in the park. This decision was inevitable. It was going to happen sooner or later and there was no pussyfooting around it. It had to be done like that and it has to be followed up with stringent action. So far, we’ve seen a few good decisions being made. Raising cab fares. Hiking up taxes on cigarettes and alcohol. Reopening vital subway stations. Amending traffic laws. All have been steps in the right direction. Granted, there have been mistakes, and serious ones at that. But that’s just how things are. Perfection does not exist, especially in a country taking its first breaths after being in a coma for almost 60 years. What many seem to miss is that these fuel price hikes were also applied to industries. Steel, cement, and every other sector that relies heavily on combustibles. And the hikes weren’t in the single digits. They were in the double digits; somewhere in the vicinity of 30%-75%. Again, there are steps in the right direction. My worry is that the whole picture is not being relayed properly to the people, or that even if it is relayed to them, they will simply ignore in their pursuit for more for less. There are follow up decisions that need to be taken and enforced, just as harshly as the fuel hikes are being enforced. If the market is allowed to go haywire, that will be the end of things. We need a structure in place that guarantees everyone plays by the rules, raises prices in a fair and justifiable manner, and is not just using the fuel hikes to make astronomical profits. Everybody wants the country fixed. Yet no one is willing to concede anything to do so. The government and the president are not the proud owners of brand new magic wands that correct 60 years’ worth of economic disasters. It’s a collective effort that starts from the bottom up. So far, all I’ve seen is different people doing the exact same things that put this country into its tailspin. Things will get better. More money coming in means more money being allocated where it is needed. Education. Healthcare. Wages. Infrastructure. Paying off sovereign debt. Egypt is screwed, and I don’t think that even the people that say Egypt is screwed when they’re having a conversation with their friends or family really appreciate the extent of how truly screwed we are. We have depleted our foreign reserves. Operative word, depleted. Brother turned against brother. Sectarian strife is rampant. Security is a mess. Law and order is a thing of the past. Morals are at an all time low. Common decency had a heart attack. Sovereign debt is crippling. So, yes, these are extremely dire times and radical solutions are needed. If this price hike gamble works and a revolution of the hungry does not ensue, then there is hope. If it does ensue, I leave the future to your imaginations. WE SAID THIS: We’d love to hear your thoughts… Please lave them in the comments below. Ibrahim Makami is a professional business writer/editor and corporate communications specialist, who occasionally writes about Egypt and its more colorful aspects and whose realism is often confused for pessimism. Like everyone in the country post Jan25, he is just another Egyptian who claims – emphasis on claims – to understand politics. He doesn’t believe in moderation (it’s for cowards) and thinks the world will explode pretty soon.